I headed out for a shakedown ride on Saturday to test how my bike would handle under a full load. 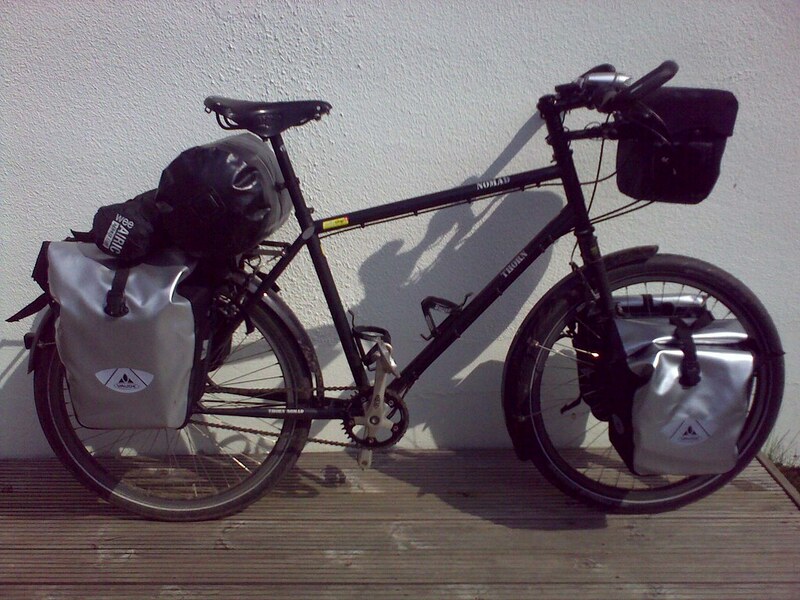 I attached my shiny new Vaude panniers and Ortlieb bar bag on to the bike and a stuff sack and bed roll on the rack for good measure. I filled the bags with books, they ended up weighing 28kg. I never plan to cycle with this sort of weight but thought it would be a good test of the bikes load carry abilities and handling under load. I was instantly surprised by how well the bike handled, it's long wheel base keeps it from being to twitchy and the 2" Schwalbe Supremes feel very grippy on the road making the ride very sure footed. The Rohloff hub allowed me to take on some steep hills with lots of gears to spare and with the Rockies and the Blue Ridge mountains to get over I'll be using every last one! The weight of me, the bike and the load will make for some very high speed down hill runs; the Nomads design should give me confidence on fast loaded descents with not to much wobble. I already ride it unladen down hill at speeds that I would not have risked on a more twitchy tourer \ cross bike. So all in all a successful first run and lets face it, I've got over 4000 miles and 3 months in the saddle to get used to it!